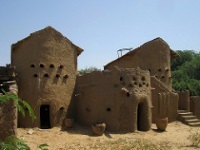 Gaoui is a charming village just outside the capital, N'Djamena. It's a good excursion for travellers who want to explore beyond the city, but can't travel far. Photographers usually enjoy the village's traditional pottery and architecture. Art lovers must visit the small museum, which contains some wonderful local pieces. Regarding its history, Gaoui was once a settlement of the Sao civilisation. The ancient culture is thought to have originated in the Nile Valley and reached Lake Chad around the sixth century BC. The Sao culture is alive and well in local folklore, and Gaoui's people continue the pottery tradition. Otherwise, the locals are generally friendly towards visitors.